President Edgar Lungu has commended Patriotic Front supporters for the remarkable campaign that has delivered all the three parliamentary by elections and 10 out of the 21 local government seats during the April 14 polls. In a statement released to the media by his Special Assistant for press and public Relations Amos Chanda, President Lungu says the PF and the opposition parties who participated in the just ended polls have set the democratic bar very high and shamed perpetrators of violence by showing that political competition does not mean enmity. “Zambians can be proud of themselves for going about their political differences peacefully. This campaign will always remind us that co-existence in diversity is possible,” President Lungu said. “In congratulating the gallant members of our great party, the PF, I wish to also commend the UPND for their formidable fight to try and win the elections. It is therefore necessary to emphasize that those parties wallowing in decidedly partisan opinion polls and hate commentary in some newspapers must be challenged to participate in elections so that we can together strengthen our democracy and allow our people to pass judgment on us,” he said. To the members of the PF, the President sent a message of encouragement and guidance that they focus on mobilization and ignore idle commentary and baseless criticism because in the final analysis, the only poll that counts is the legitimate ballot cast under the country’s democratic arrangement. “As your President, I am asking each one of you to step out, recruit new members, and energize our structures at every level. Therefore, to those who seek to distract us, we are saying: “Seleni, tubombeko”! The Head of State observed that the self-proclaimed popularity by some politicians was simply hot air because they have failed to put their claims to a test through the ballot. “With humility of heart, I wish to congratulate those who participated in the just ended by-elections for running a good race. I also salute the people of Zambia, the voters, for ensuring that the campaigns were peaceful. The Head of State observes that the PF victory has come amidst a smear campaign by those who seek to create delusional enemies. “This victory has come when reactional forces have mobilized to divide the nation, instilling fear in citizens of good conscience while trying to buy sympathy to cover up for their inadequacies. “As your President, I will move from province to province, district to district, town to town and village to village to ensure that we expedite the rate at which development reaches our people. In the coming days and months, I will roll our Presidential initiatives to guarantee food security to our people,” he said. The President stressed that the current generation of politicians owe it to the next generations to prove to them that a political opponent is not an enemy. The real enemy is the challenges we must overcome as a nation. To the tireless PF members who abandoned their homes to camp in all the three constituencies, and campaigned from their hearts, the President assured that their sacrifices have built the foundation of the party’s journey towards 2016 and beyond. This only shows that Sata’s leadership was flawed and based on Political violence. “This victory has come when reactional forces have mobilized to divide the nation, instilling fear in citizens of good conscience while trying to buy sympathy to cover up for their inadequacies”. And the same people are busy claiming that this is RB controlling Lungu so that the can PERSECUTE the saint in Mutembo Nchito our Honorable DPP who has served the Zambian People dilligently…My foot! HH and his funded hate campaign on ZWD has really BACKFIRED !! Long live president Edgar Lungu, long live Zambian democracy! Ba HH BP yakwela! Lungu ewo tulefwaya! THERE WAS CELEBRATION IN RB’S CAMP FOR RETAINING THE 2 MMD SEATS AT THE EXPENSE OF DISMANTLING PF. WHILE THEIR MASTERS IS BEING THANKFUL AND PF CAMPAIGNING FOR THEIR OPPONENTS. Ati seleni tubombeko, kikikiki umulwele aleumfwako bwino, he is in a jovial mood. Other day he was running… Bana Dalitso tabalelale these days!! it is only PF in the whole world which has never lost a seat ever since it was formed…. seleni tubombeko imwe!!! Okay I must say- perhaps the very good performance of the UPND in the January 20 elections was largely due to the fact that the PF did not campaign effectively. @darklord,the undp didnt perform well, i am preview of how they where playing trick engineered by jv and padick patel especially in southern and northwestern provinces,they where taking advantage of the cash shortage in the PF created by their connection whiteman,now watch what the actual results are going to shape up like going forward..HH IS PUT BACK WHERE HE BELONGS . Awe the January election was a reflection on how people felt about the dead man Sata. He was a divider and Zambians didn’t like that. Zambians, what a humble, down to earth president you have ! Very few , if any can bend so low. Chest-thumbing leaders will interprete it as cowardice. Blessed are the humble……………………..
HH and his followers, especially the UK UPND Team are a bunch of useless guys. I was at a function just before elections, held in Hendon Central – London organised by the UPND UK Team. The guy or their so called UPND Chairman was useless. He was asked what was the vision for Zambia. The guy had nothing to say. These are the same guys who have over amplified HH’s visit to the Royal African Society in the UK. They failed to fill up an 80 Room venue yet they went bogging on ZWD telling lies that the venue was over subscribed. LIES & LIES. Finally, the story was HH was invited by OBAMA to the White House, however OBAMA changed his mind on the last minute. I have been reliably informed that at this same meeting HH attributed the depreciation of the Kwacha against the US$ to ECL becoming president of Zambia but someone asked HH to explain why other currencies have also depreciated against the US$ where ECL is not president. He was speechless. Where is the outspoken Hildah Malama of the “f00l” slogan? Welcome her as you(PF) dine and wine after she comes out of her ‘ bereavement ‘ mood. Actions speak louder than words. The voters have spoken. God works wonders! The fact that you cannot make any utterance without mention of UPND and HH is clear sign that you are all terribly scared of this visionary. Your wish is that he could somehow vanish and fail to feature in 2016 tri elections. Isn’t UPND performance in this by election marvelous? The party is spreading despite your shriveled malice. This lack of violence was because Jean Kapata, commander in chief of PF thuggery was in an extremely sober land! Well done Kachasu Man. As a Sangoma president, you have shown every one that believing in Sangomas is beneficial. Indeed you have ashamed those who believe in the Living God. But the English, is too good to come from President Sangoma. God is Great. Sangoma is a liar. Mmmmmmm: You know how to comment my sister. As a medical Doctor at UTH, you too deserve a quarter of a century with 3 children 2 boys and a girl. I think you are the greatest commentator that i have ever seen. Indeed you know and you are a true democratic of freedom of speech. I agree with you. The English attributed to President Edgar Lungu is too smooth to be written nor spoken by Edgar Lungu. Some one in State House must have written the speech for Lungu and then give him to rubber stamp. The Hell of a President cannot speak such a well refined language. Lungu is just a Form Five Failure who managed to go to UNZA through rewritings. Frankly Speaking: UPND has not lost but has rather gained. @Hildah Malama your hope is very fake! !you guys in UPND do you really think with sober minds or you attach tribe when thinking?surely you still believe that PF can lose to UPND just after 1 term in office despite all projects across Zambia which PF had initiated?YOU’LL DIE FROM BP IN 2016 ONCE YOUR HH LOSES FOR A RECORD 5TH TIME! !its like you support “SHEPOLOPOLO” and hope that they’ll beat “MIGHTY FC BARCELONA”,a thing which 100% cannot happen!! !between now and 2016,PF will remain very strong in Lusaka,Eastern,Copperbelt,Luapula,Northern,Muchinga and part of Central.so how will HH win by coming out 1st in 3 or 4 provinces only?ITS IMPOSSIBLE FOR HH TO WIN IN 2016! !HE LOST IT WHEN HE FAILED TO DEFEAT A DISORGANISED PF ON 20/01/2015!! Unless you are so mentally crippled. How do you expect PF to win when it has just been swallowed by MMD? In case you are not aware, Lungu is preparing a handover of the 2016 presidential candidature to RB sometime in March 2016. The MMD python is slowly squeezing life out of PF! I was listening to King Goodwill Zwelithini of the Zulu call foreigners lice & ants, then I’m thinking what hate can do. So please everyone easy. Both ECL & HH are zambians. They both say in their own way that they want to serve us. If you prefer one & not the other you do not need to hate. This is good counsel,thanks very much, may God bless you. You, Itizi Turu speak well my fellow Zambian. Congratulations to the PF for increasing their legislative muscle and for showing how well they have recovered from the previous internal wrangles. it was a good feeling to see Miles Sampa very involved in the Chawama parliamentry campaigns. Well done UPND for participating and accepting the results. UPND’s contribution to the democratic dispensation is well appreciated. 2016 nafuti nafuti,nikolopa.com.we are in the 8th minute of the first half of the match and its already EL 3 vs HH O. Am worried coz HH is already on yellow card. Well said EL, with the tone of a national leader. To those doubting the so called English, remember this is a lawyer who like other presidents world over has the luxury of having speech writers. You are 100% correct, i`m with you on this one. No one is talking about MMD or FDD or UNIP. This is a good sign for UPND and democracy in the country. Imagine if UPND was as weak as MMD we could have been in one party state affairs by now. This gives hope that at some point we can change govt for the better or the ones in power can change for the better so their retain the power. Both sides of this concept will work for ordinary Zambians. Whatever the case will be, in the 2016 elections, Lungu will win in Lusaka Province, CB, Luapula, Northern, Muchinga, Eastern. HH will win in NW, Southern, Western. Lungu and HH will share Central. HH will make ‘some’ inroads in the PF strongholds but they will be countered by the PF gains in Western. All in all, Lungu’s PF is destineed for another victory in 2016. Mark this posting and refer to after the 2016 elections. Finshi ulesabaila! 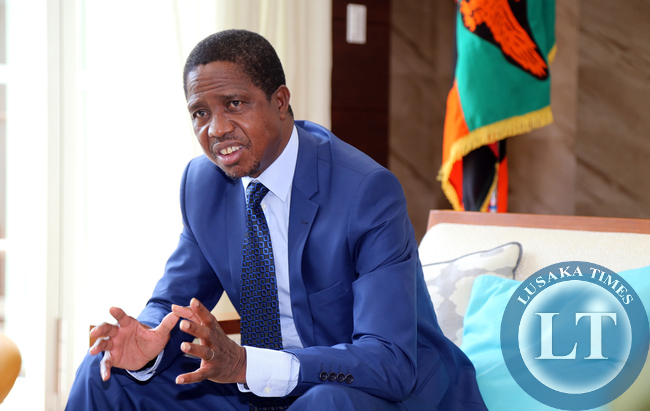 Edgar Lungu is the president of the Republic of Zambia. If you are living in Cuckooland then it is ok for you to have RB!